Wiith or without a Yoyo stroller rental. DescriptionOlder child tired to walk? Hop, a Babyzen Yoyo stroller board is installed in a second! Connects to the stroller in a single one-hand click. Can carry a child up to 20 kg. Child can choose to stand or sit on the easy-to-remove saddle. When not in use, board can be folded into space-saving storage positions. For children aged 2- 5 year-old (20 kgs max). For visiting Paris with closed-age children, renting a Babyzen Yoyo stroller and a board is the perfect set. Easy to install, remove or fold, the Yoyo board will allow the older child to rest when needed. With a easy-to-remove saddle, he will choose if he prefers to stand to enjoy view on the city or sit to rest. Board can be use with a 6m+ stroller or a newborn pram. 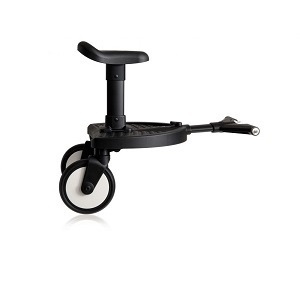 And when not in use, board can simply be folded to make strolling even easier. You may read our customers testimonials here or on our Facebook or Google page here.